Healthcare-associated infections (HAIs) not only cost the healthcare industry billions of dollars, but also lead to thousands of deaths each year. Additionally, Medicare stopped reimbursing hospitals to treat various infections in October of 2008, according to a new infographic from Curos. This infographic illustrates the healthcare costs associated with infections, as well as infection prevalence, fatality, prevention, causes and more. The author of this step-by-step guide, Leading a Hospital Turnaround: A Practical Guide shares what he learned while leading several successful financial turnarounds. Along with concrete tools and action plans, he provides candid advice about minimizing the fears of employees, physicians, and board members. In this book, you will learn how to preserve crucial relationships while directly addressing difficult questions. When designing care management programs for dual eligibles, you need to recognize the strong connection between the medical, the social and the behavioral, explains Timothy C. Schwab, MD, FACP, former chief medical officer of SCAN Health Plan. Ultimately, you are caring for the individual; one person in charge of the whole program. We meld all that into one care management program  the medical, the social, the behavioral. And then we utilize expertise from the medical sides; for instance, for a patient with diabetes, we use our diabetic disease management module by that geriatric care manager. Or for behavioral health issues, we use the behavioral health side of the program. But again, it all focuses on the individual; one person in charge of the whole program. When you design for the dual eligible population, you can divide the population into those that are frail and disabled as a primary type of program, but also recognize that this is a low income population with multiple complex chronic conditions. Coordination is the critical link between the social and the medical. Incorporating the traditional things like disease management, utilization management, transition management and complex care management is essential, since all of these are very critical and interrelated. Excerpted from Community Care Connections for Dual Eligibles: Closing Social Gaps to Improve Health Outcomes. Inaccessibility to WiFi leads to a loss in time of almost 45 minutes per day at healthcare organizations, which results in a $1 million loss each year, according to a new infographic from Inspire WiFi. This infographic illustrates why advanced WiFi connectivity is indispensable to organizations in the healthcare industry and how it mitigates the concerns related to the complexity of wireless. You may also be interested in this related resource: 2013 Healthcare Benchmarks: Telehealth & Telemedicine . Telehealth’s broad reach encompasses telemedicine — the use of telecommunications technology to deliver clinical diagnosis, services and patient consultations — as well as the exploding field of mobile health. This resource documents trends and metrics on current and planned telehealth and telemedicine initiatives and includes a year-over-year comparison of telehealth trends from 2009 to present. A new economy is reshaping healthcare delivery, measurement and funding. Changes in the way healthcare is delivered, evaluated and funded are having a serious impact as the industry gradually shifts from productivity- to population-focused compensation, according to Cynthia Kilroy, senior vice president of provider strategy and business development at Optum. We are seeing five trends in the healthcare industry that are affecting value-based reimbursement, with implications for each. First, there is a consolidation of the provider community: physicians are organizing, and hospital systems or large integrated delivery networks (IDNs) are actually purchasing physicians. We’re seeing both affiliated and employed models going on in the market right now. Another influential trend is system affordability. We’ve talked about this a lot, but premiums have been increasing significantly more than 30 percent over the last five years. A lot of the challenges and what CMS and some payors are trying to focus on is, how can we make healthcare more affordable to the community at large? A third area of trends is the value-based care models, or the alignment of economic and practice incentives to create accountability. This does not just relate to volume, but also to how to manage populations. Which leads into the next trend, which is the investment of provider organizations in capabilities and tools to manage populations. The result is that the incentive models are moving more toward that population-based care, which is much more challenging to measure. And then finally, we have a lot of interest in performance metricsHCAHPS,® for example. 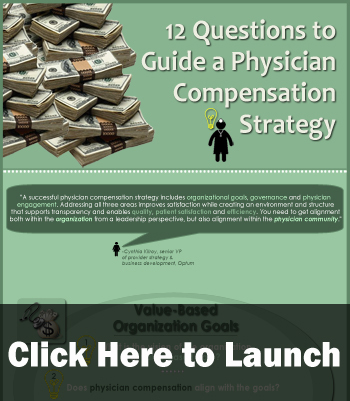 With just about every other payor asking for different performance metrics from organizations, how do we really focus, especially from an incentive program for physicians, into the right incentive? More than likely, each organization is going to be different about what they’re trying to achieve; each market is very different. From the first encounter on a benefits enrollment website to hospital discharge, the healthcare industry is looking to improve care quality and patient satisfaction. However, 83 percent of Americans do not follow treatment plans given by their doctor as prescribed, according to a new infographic from Codebaby. This infographic chronicles the average experience of Americans, from making an appointment to follow-up treatment and everywhere in between. Looking to enhance the patient experience and better coordinate care? You may also be interested in this webinar replay: Integrating Mobile Health Remote Patient Monitoring with Telephonic Care Management for Improved Care Coordination Results. Improving care coordination improves the overall patient experience and satisfaction. During this webinar, Gail Miller, the vice president of telephonic clinical operations in Humana’s care management organization, Humana Cares/SeniorBridge, shared details of their telephonic care management program and how these remote monitoring pilots will enhance their care coordination efforts. Seventy percent of executives say keeping supply chain costs low is very important to addressing key financial hospital issues, according to a new infographic from the Global Healthcare Exchange. This infographic also identifies inefficiencies in current hospital supply chains, the cost of these inefficiencies, the origin of surgical delays and disconnected systems leading to unsatisfied patients and more. Another major cost to hospitals is unnecessary readmissions. Therefore, you may also be interested in Health Care Operations and Supply Chain Management: Strategy, Operations, Planning, and Control. This resource offers a thorough foundation in operations management, supply chain management, and the strategic implementation of programs, techniques, and tools for reducing costs and improving quality in health care organizations. As the number of public and private accountable care organizations nears 500, participants are fine-tuning the ACO model. In the few years since the ACO model entered healthcare’s consciousness, administration has shifted from hospital-led to physician-only leadership to PHO-helmed ACOs. In its third annual industry survey on ACOs, conducted in 2013, the Healthcare Intelligence Network captured how 138 healthcare organizations are participating in ACOs. Drilling down to the multi-specialty physician group perspective, this survey analyzed the number of existing ACOs for this sector, which providers participate in the ACO, and more. With their built-in cadre of healthcare providers, multi-specialty physician groups (referred to here as physician groups), which comprised about a tenth of survey respondents, would seem ideally placed to transition to accountable care organizations. 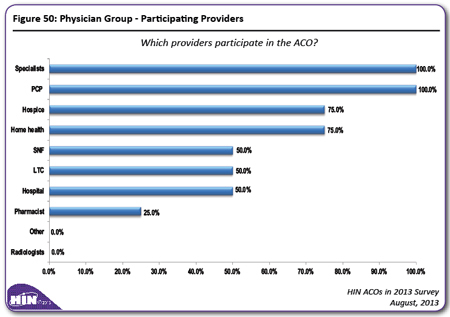 Percentage-wise, this sector has the highest rate of existing ACOs (57 percent participating in ACOs versus 34 percent of overall respondents) and twice the rate of participants in the CMS Pioneer ACO program (25 percent versus 13 percent). In other deviations from the norm, twice the number of physician group-reported ACOs favor the hybrid FFS + care coordination + shared savings payment model (75 percent of physician-group ACOs versus 37 percent of overall respondents). More than half of ACOs in this sector are administered by independent physician associations (IPAs), and most are smaller than the hospital-sized ACOs reported in the survey, with three-quarters reporting a physician staff of less than 100. These ACOs benefit from having specialists on board in greater numbers to help with care coordination of the chronically ill (100 percent include specialists, versus 71 percent overall). They also unanimously include nurse practitioners (versus 90 percent of overall respondents) and with 50 percent including clinical psychologists in the ACO (versus 42 percent overall), are a little further along on the path of integrating behavioral health into the accountable care initiative. Cognizant of the full care continuum, these IPA-led ACOs are almost twice as likely as overall respondents to include skilled nursing facilities (50 percent versus 29 percent overall) and hospice (75 percent versus 42 percent overall) in their ACOs. Infographic: Can Bundled Payments Solve Healthcare Dilemma? Bundled care has become an essential component of future care delivery models, delivering better care and outcomes at a reduced cost. Payors and providers rank bundles first in affordability among care delivery models, according to a new infographic from Booz & Company, Inc. This infographic also includes specific features and benefits of bundled payments, results from hospitals that have used bundles, effects of bundled payments on cost and reimbursement, and more. You may also be interested in this related resource: Healthcare Innovation in Action: 19 Transformative Trends. This 40-page resource not only contains vital information on healthcare accountability, bundled payments and consolidation, but also examines a set of pioneering efforts supporting the industry’s seismic shift from a volume-based culture to one rewarding value and patient-centeredness. Posted in Bundled Payments, Healthcare Costs, Infographics | Comments Off on Infographic: Can Bundled Payments Solve Healthcare Dilemma? From ‘street case managers’ that help locate and engage the homeless to tribal leaders who are liaisons to the Native American population, Health Care Service Corporation (HCSC) has assembled a dream team of community partners to support care coordination of dual eligibles. 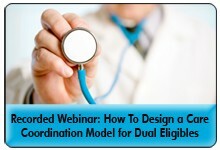 Community mental health centers, public health agencies and community agencies round out the cadre of care coordination supports for Medicare-Medicaid beneficiaries, explained Julie Faulhaber, HCSC’s vice president of enterprise Medicaid during a recent webinar on Moving Beyond the Medical Care Coordination Model for Dual Eligibles. This safety net for dual eligibles is a hallmark of three duals care coordination models launched by HCSC in 2014two in New Mexico and one in Illinois. Results from a home-grown health risk assessment, or HRA, (conducted telephonically in almost all cases) enables HCSC to risk-stratify duals and refer them to appropriate care teams. Other care coordination elements include interdisciplinary teams, a whole-person rather than diagnosis-driven focus and novel care and services planning that encourages out-of-the box thinkinglike the installation of a grab bar in the home of a senior somewhat unsteady on her feet. “Putting in a grab bar might cost $150 to $200, but when you think about that in terms of having that member have a fall and having them hospitalized and the rehab cost, it just makes sense for the member’s quality of life and comfort to know that there is something there to help them,” noted Ms. Faulhaber. HCSC takes great care to consider the needs of individuals with disabilities as well as those with behavioral health concerns, Ms. Faulhaber stressed, citing a 2006 study that found that individuals with severe mental health issues die 25 years earlier than those without. While HCSC’s duals care coordination interventions are new, Ms. Faulhaber believes efforts will pay off for the organization’s Medicare-Medicaid members. In her more than 10 years experience with Medica Health Plans in Minnesota, where she was responsible for the dual eligible product suite, duals care coordination significantly enhanced quality and utilization metrics for that population. Despite the efforts of HCSC and other payors to enhance duals’ care coordination, significant roadblocks remain, such as transportation, a lack of integrated care, and the population’s typical low scoring in risk adjustment, a common trend in groups with primary behavioral conditions, she explained. Listen to an interview with Julie Faulhaber of Health Care Service Corporation here. Readers, how are you rising to the challenge of duals care coordination? Are your case managers ‘on the street’ like HCSC’s, or do you have other ways of identifying and assisting the dually eligible with their physical and behavioral health needs? Share your ideas with this community.